Fashion blogger, actress and TV host Grasie Mercedes of Style Me Grasie shares one her favorite local picks in Los Angeles. What is it about a day at the beach that makes me crave fried seafood afterwards? I know I can’t be the only one who feels this way. 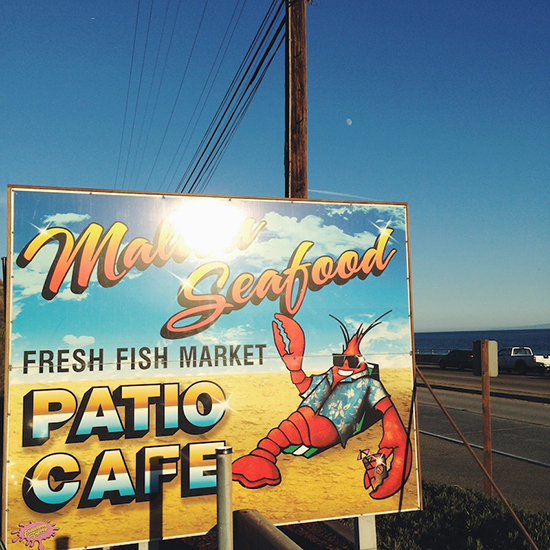 Enter Malibu Seafood: Set along the Pacific Coast Highway, the view is tremendous and the food is so very delicious. My personal favorite menu item is the clam strips and fries. I love anything fried but these clam strips are cooked to perfection with a breading that’s tasty and crunchy. After you’ve eaten your fried clams, make sure you try the fried fish sandwich; which is basically a gourmet version of the McDonald’s Filet-O-Fish. There is always a line out the door on the weekend, but it’s worth the wait. Plus, you’re across the road from a beautiful beach, so take in the view of the surf while you wait. Malibu Seafood also has a pretty impressive fresh fish market; you can have all the fried fish you want for lunch and then bring home a salmon filet to grill for dinner. Bonus for a fish shack: It’s open 7 days a week throughout the year. Visit on a chilly, LA “winter” day and order the homemade clam chowder in a bread bowl and feel like you’ve been transported to a beachside town in Cape Cod. Did I mention they serve fresh lobster cooked to order too? Yeah, this place is pretty great.